In 1980, Classic Metal Roofing Systems purchased its first two products from Kaiser Aluminum in Toledo, Ohio-Rustic Shingle and Rough Shake. Rustic immediately became the company’s flagship product and has been ever since. After 50 years of existence and 30 years with Classic, Rustic Shingle has been proven on over 100,000,000 square feet of roofing around the world. It is quite likely residential roofing’s most proven and longest-running product. Homeowners who choose traditional roofing materials such as shingles or wood shakes always face the inevitable reality that one day those products will split, rot, and mold. Rustic Shingle allows you to enjoy the beautiful aesthetics as unique as your home without compromising the integrity of your roof. 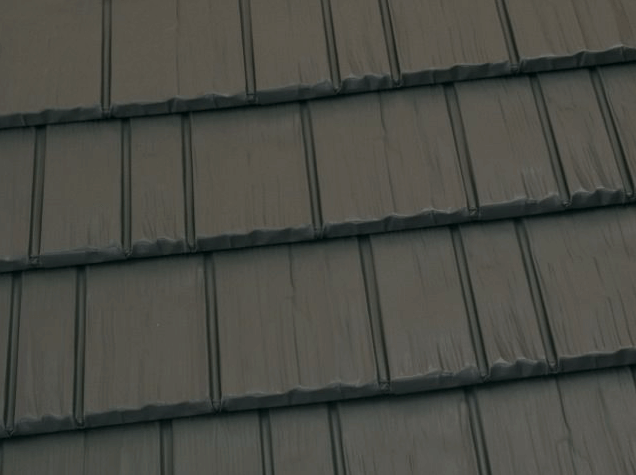 Rustic Shingle’s combination of distinctive looks and indisputable benefits creates a roof system that will protect your home from all of life’s challenges – whether a severe windstorm or rising energy costs. You have invested heavily in your home. For most of us, it is our largest single investment. Our mission includes manufacturing products worthy of your home—products with unmatched quality, benefits, and beauty. Rustic Shingle is a lifetime roofing system of the highest quality and design. Our Kynar 500® or Hylar 5000® PVDF resin-based finishes are guaranteed to resist fade and chalk. The four-way interlocking panels will withstand hurricane strength winds and hail. And because of aluminum’s high emissivity and our highly reflective coatings, Rustic Shingle can save you up to 25% on your energy bills for the rest of your lives—hard earned money that could be much better spent.